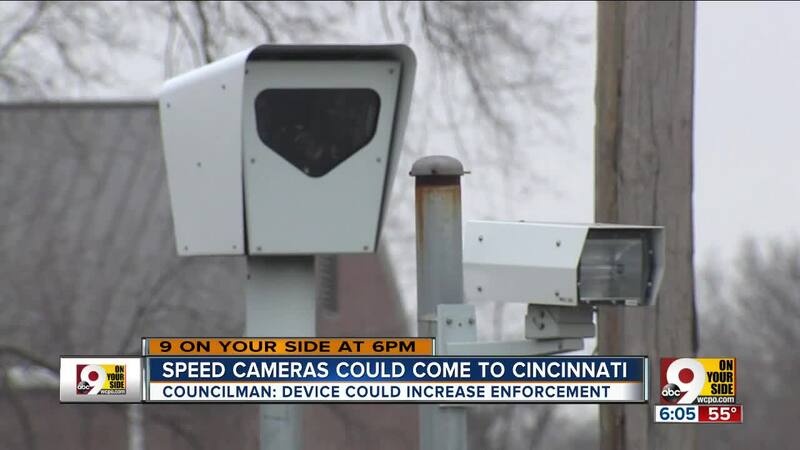 Cincinnati police looking at speed cameras to increase traffic enforcement, but are they legal? CINCINNATI — With already paper-thin staffing and resources , Cincinnati police are looking at alternative methods of law enforcement to address a mounting traffic and pedestrian safety problem. 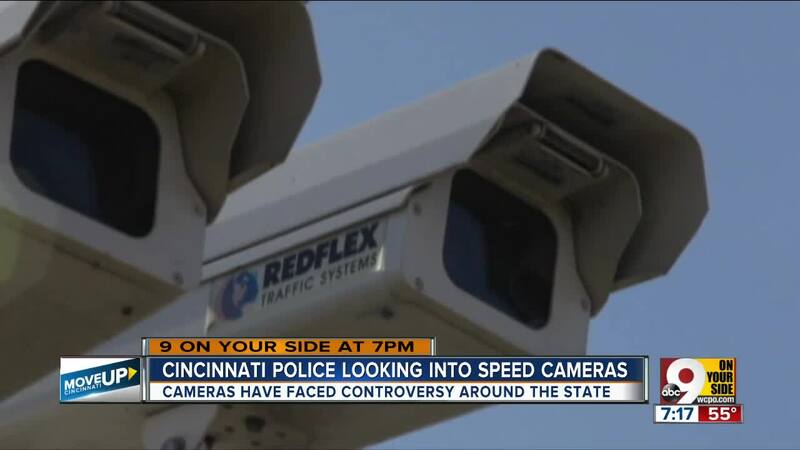 Their options include what has become a controversial solution in Ohio: speed cameras. In a memo last month, Cincinnati Police Chief Col. Eliot Isaac said early efforts to increase traditional traffic enforcement measures, such as traffic patrolling and isolating speed hot spots, had been underwhelming. "(E)arly indications suggest current increased enforcement efforts have not yielded the desired results in terms reducing serious injury and fatal crashes," Isaac wrote. That's why Isaac's department is looking at speed cameras. In the Jan. 22 memo to the city administration and City Council, the police chief called officer hand-held speed cameras a "promising piece of technology." "Much like other technology initiatives employed by CPD ... this technology could be a force multiplier minimizing some of the need to assign additional personnel to this task (of traffic enforcement)," he wrote. The speed cameras Isaac has in mind wouldn't be mounted to traffic lights or sign posts like cameras that have been contested in other cities across Ohio. Instead, they would look like radar guns but would capture a photo of a vehicle's license plate and measure the vehicle's speed. The theory is that they would accelerate the process of issuing a speeding citation, saving officers the time required to perform a traditional traffic stop. They would also require Cincinnati voters' approval, Isaac said in his memo. Retired Mason police officer Derek Bauman agrees they could save officers time and result in more enforcement of speed laws. "Best-case scenario, if you’re really hustling because you’re trying to do this as quickly as possible -- which is not necessarily the safest thing to do -- but if you are, maybe it’s 10 minutes," Bauman said about the process involved in issuing a traffic citation through traditional means. "It could easily be 12 to 15 minutes depending on the variables there. "It becomes a point where this just isn’t effective. There’s physically not enough manpower to cover all of these streets." Bauman has become an advocate for traffic and pedestrian safety issues since retiring from the police force in 2016. For him, the cameras are a tool for streamlining a time-intensive citation process. "I think it’s just like anything else. It brings an efficiency to the system," he said. City Councilman Greg Landsman hopes the cameras mean more drivers will be cited for dangerous behavior on the roads. In a Jan. 7 motion, he asked CPD to study the feasibility of adopting speed cameras or other technological solutions. "It makes a big difference whether or not we are enforcing our traffic laws, our speeding laws and getting people to slow down, which at the moment is a life-and-death thing," Landsman told WCPO. "People are getting hit every day and many of them are children. Some of them are not walking away from these crashes." In 2018 more than 400 pedestrians were involved in crashes — the highest number in recent memory, which has steadily increased over the last six years. The fall semester of that year saw a dozen Cincinnati Public Schools students struck while walking to school, including 15-year-old Western Hills University High School student Gabriella Rodriguez, who died after a still-at-large hit-and-run driver struck her on Harrison Avenue. Alongside speed cameras' increased efficiency, however, arise legal and constitutional questions. Steve Magas is an Ohio trial attorney based in Anderson Township. He also has dealt personally with a camera-issued citation, after he was driving his wife's car in Dayton, Ohio, in 2014. "I thought it was like a spam mail," he said, when weeks after their trip to Dayton, his wife, Lisa, got a letter in the mail, saying she was caught speeding. "She got something in the mail and I thought, ‘Well, that’s weird.’ We open it up and it’s a citation in the mail for speeding. I was driving. But it was addressed to her." That's because, even though Steve was driving, the citation went to the vehicle's registered owner: Lisa. This raised alarm bells for Magas, who said the camera-issued citation jeopardizes drivers' and vehicle owners' rights to due process in part because they do not require a sworn officer to witness the alleged infraction personally. "The right to avoid self-incrimination, that’s out the window," he told WCPO. "The right to due process and the right to have real people sitting in a witness chair saying things out loud that you can then cross-examine, that’s out the door. "It seems like a slippery slope to start sliding down," he said. Multiple Ohio cities and villages already have navigated that slope with mixed results. In 2013, Hamilton County Common Pleas Judge Robert Ruehlman ruled fixed, unmanned speed cameras unconstitutional. Similar rulings have since come down in the village of New Miami. At the same time, the Ohio Supreme Court since has ruled that speed cameras in Dayton do not require an officer to witness the traffic offense. Magas said there is value in the traffic stop process, even if it's time-consuming. "When you’re stopped, and you’re given a ticket, then you feel like, OK, now you’ve got something to work with," he said. "If you get something a month later in the mail, and it’s, ‘Here, write a check or else’ sort of a deal it’s just, from the legal side of me says, ‘That’s just not right.’"
It also created a situation where Magas still doesn't know, five years later, if he actually committed a crime, partially because several weeks separated the day his wife received the citation and the day the citation was issued. "I don’t know if I was speeding or not. They said I was," he said. "You know, great, maybe we were going 10 or 11 over the speed limit, and that may have been true. I don’t know." Landsman hopes his plan — equipping officers with hand-held cameras — will sidestep that legal question and avoid opening the city to litigation. "It’s simply the police officer is still the one determining if you were speeding with the technology, with the camera. It’s just the ticket goes home, and then you can still contest it," he said. Magas agreed that the technology itself is not a problem as long as it is accompanied by an officer's sworn testimony. "Using the technology to capture evidence, there’s certainly nothing wrong with that," he said. The city of Hamilton recently extended its contract for hand-held cameras, according to WCPO news partner the Journal-News. For Landsman, the motivation lies in making Cincinnati's streets safer by discouraging dangerous driving habits. He said any traffic enforcement revenue generated by CPD speed cameras should be earmarked for pedestrian safety infrastructure improvements that could calm traffic in busy areas. "We are doing this, at this point, not for the money. In fact, all of the money will go into pedestrian safety," he said. "The only way to get those resources, though, is through enforcing these traffic laws, and the only way to do that effectively is with this technology." Ultimately, voters will decide. Cincinnati's city charter currently prohibits the use of cameras as a traffic enforcement tool. "That’s a good thing," Landsman said. "Voters will get to say, ‘Here’s how we want it. We only want it to be used in certain areas — say schools — and the money can only go to certain things like pedestrian safety.'"